The latest data on Arkansas personal income indicated a disappointingly slow growth rate in the first quarter of the year. Total personal income increased at an annual rate of only 2.5% from 2017:Q1 to 2018:Q2, compared to the national average rate of 4.3%. * Only one state registered a lower growth rate (Idaho at 2.0%). Personal income growth was lower than the U.S. average in nearly every major component. Farm income was particularly weak, declining at a 35.5% rate relative to the fourth quarter. Farm income is a fairly small component of total personal income, however, and can be highly variable from quarter to quarter. All components of Earnings by Place of Work increased at lower rates than the national figures, with Proprietors’ income declining at a 5.5% rate in Arkansas while increasing at a rate of nearly 5% nationally. The only major component for which Arkansas outpaced the nation was Dividends, interest and rent (DIR). Although the data represent only one calendar quarter, the 2018:Q2 growth rates contribute to an ongoing trend of divergence between DIR, on the one hand, and Wages & salaries (WS) on the other. 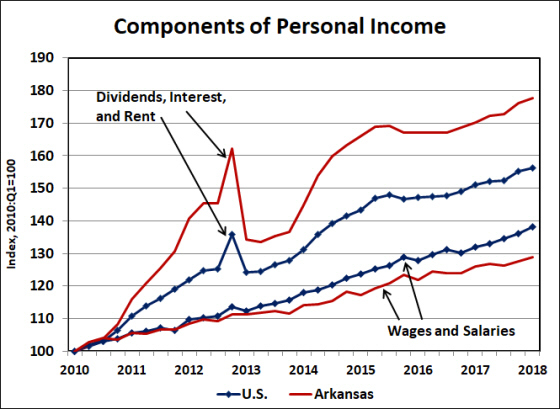 As illustrated in the figure below, since the beginning of 2010 the DIR component of personal income has grown far more rapidly than total personal income — and has grown more rapidly in Arkansas than in the rest of the nation. 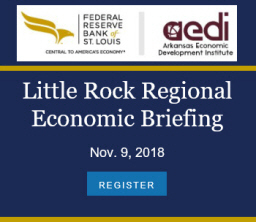 From 2010:Q1 through 2018:Q1 the growth rates for Arkansas and the U.S. were 7.5% and 5.7%, respectively. In contrast, WS growth over the same period has averaged only 3.2% in Arkansas while growing a a rate of 4.1% nationally. So not only is DIR growth far exceeding WS growth, but the gap is wider in Arkansas than elsewhere across the nation. The upshot of this pattern of growth is that wage and salary growth has only accounted for 37.7% of total personal income growth in Arkansas since 2010, while it has accounted for over half of total income growth nationwide. 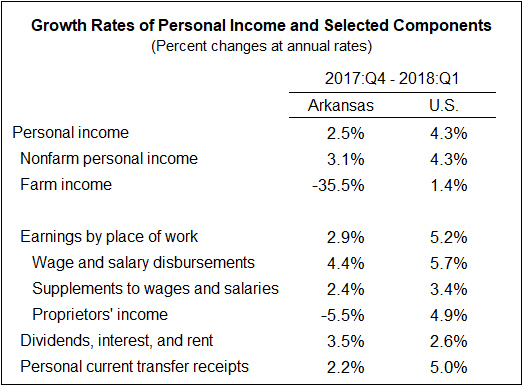 In contrast, the DIR component accounts for about one-quarter of total personal income growth nationwide, but accounts for over 35% of Arkansas’ income growth. So although the growth rate of total personal income in Arkansas has closely tracked the national average for the past eight years (at just over 4.0% annually), a far greater share of the income gains has gone to owners of capital, rather than to wage earners. In recent quarters, the disparity between DIR and WS growth appeared to be dissipating. The strength of DIR in the first quarter might be just a blip in the data, or it may indicate a resurgence of rapid growth in that income component going forward. We’ll continue to monitor the growth rates of these income components as more information becomes available. *In the news release that came out yesterday, the BEA initiated a practice of expressing quarterly personal income growth in terms of annualized percentage changes (as is done for GDP and other economic aggregates). We will henceforth follow that convention here as well.